REDDCO Inc. supplies a complete selection of egress wells, egress well covers and egress windows in a wide range of prices. 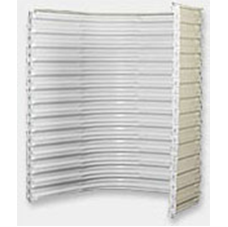 Our large inventory allows us to quickly meet any egress well requirement you may have. 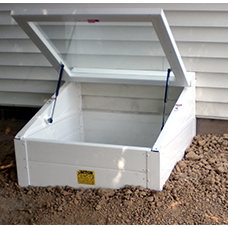 We have egress wells that range in heights from 8 to 106 inches high and widths from 36 inches to 16 foot wide. The economy stone look egress wells & covers are designed to meet all of the IRC Code requirements. 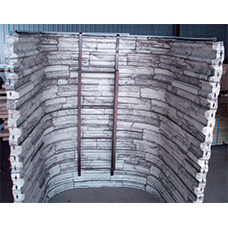 These wells are one-piece and they are constructed using heavy 18 gauge (.0475”) corrugated steel. The steel is also painted to look like stones on the inside and tan on the outside. Many people decide to go with the stone-look because it helps to hide dirt that tends to accumulate on the inside surface of the window well. Economy Egress Wells are available in two widths 49”, and 55” have a 36” projection from the foundation wall and come in 24”, 36”, 48”, 60”, 72” and 84” heights. Please keep in mind that egress window wells that are deeper than 44” are required to have a ladder to meet current IRC code. For more information on cover for the stone look egress well please call. 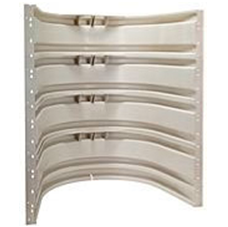 These made in the USA wells come available in six different widths which include: 49”, 55”, 61”, 67”, 73”, and 79”. All of the wells have a 36” projection have a 36” projection off of the foundation and come in heights of 24”, 36”, 48”, 60”, 72” and 84”. The great reason to use our economy series window wells is that there is no on-site assembly. Also, the rigid corrugated steel design means that wood backing is necessary during back filling. 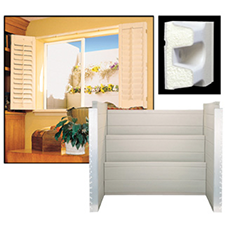 This economy series window wells is affordable and extremely easy to install. To learn more about the economy series wells and covers please click here. Our Compact Economy Egress Window Wells are some of the smallest window wells on the market. However, all of our wells still meet IRC Code of 9.0 sq ft of surface area. 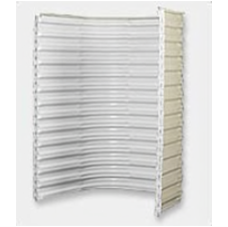 Our Compact Economy Series are just 9.5 square feet. 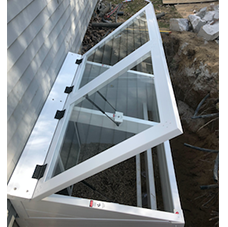 Like our other window wells, the Compact Economy Series are one-piece and come in one width of 42”, they have a 36” projection off of the foundation wall and come in four heights (24”, 36” 48”, 60”) These egress window wells have an outside width have an outside width of 43 ½”. To learn more about the compact economy series please click here. This one-piece, no on-site assembly, window well is constructed with rigid fiberglass so no wood bracing is necessary! In fact, the designer series window wells are some of the easy wells to install. Designer Egress Wells are available in 54” and 66” widths, have a 38” projection from the foundation wall and come in 48”, 60”, 72” and 84” heights. A 12” extension is used to make the well 84” high. Our designer wells also have a ladder that is molded into the window well for extremely easy escape. The Redi-Exit Deluxe Compact Series Egress Wells are the smallest window wells on the market today. These super compact egress wells are also some of the most attractive wells available that still meet IRC Code. You’ll want to use these wells when space is limited since they are only 9.0 sq ft in size! These wells are available in 36″, 42″, 54″ and 66″ inside width, has a 36″ inside projection off the foundation wall and come in twelve heights; 6? 8?, 14?, 22?, 30?, 38?, 54?, 62?, 70?, 78?, 86?, and 94?. These wells are shipped in pieces are do require simple assembly. They are easy to install in tight spaces! To fid out more details please click here. What makes an egress window well or cover premium? Our premium egress wells are made from 100% UV treated PVC that operates across a wide range of temperatures. 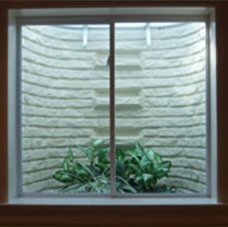 The premium egress window wells are available in white or tan and clay as a special order. As always our wells are made in the USA and are IRC code compliant. Premium Egress Wells are available in three inside widths, 42″, 54″, 66″, has either a 40″, 42″, or 44″ inside projection off the foundation wall and come in 10 different heights – 22″, 30″, 38″, 46″, 54″, 62″, 70″, 78″, 86″, and 94″. To find out more specs about our premium egress window wells please click here. The Bilco ScapeWEL Garden Step Egress Well works with all of our Redi-Exit Egress windows. This well is also constructed with durable and efficient UV-Stabilized Polyethylene plastic. 42”, 54”, and 66”, has either a 41” or 49” projection off the foundation wall and comes in three heights 48”, 60”, or 81” high. To learn more about these wells please click here. This attractive egress well is constructed of UV-Stabilized plastic, which comes in a neutral driftwood color with a pebbled finish. The name “Modular” comes from the action of stacking the modules to accommodate a wide variety of heights up to 98”. Call REDDCO Inc today at 866-996-1989 to see what we can do for you! Note: See additional Egress Window Wells info and links below!